Nasal Spray Recall Announced – Product Quest Manufacturing of Holly Hill, Fl, has recalled Lot# 173089J of CVS Health 12 Hour Sinus Relief Nasal Mist, because the product was found to be contaminated with the potentially pathogenic bacterium, Pseudomonas aeruginosa. CVS Nasal Spray Recall – Product Images. 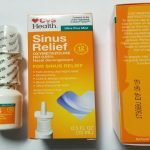 CVS Health 12 Hour Sinus Relief Nasal Mist is used as a nasal decongestant. The recalled product is packaged in a 0.5 fluid ounce bottle that is placed in an individual folding carton (IFC), bearing Lot # 173089J and EXP 09/19. According to the manufacturer, 16,896 units were released with UPC code 50428432365. The product can be identified by a white nasal spray bottle and an orange label with Sinus Relief stated in white with CVS Health on top left. The IFC containing the bottle is also orange and contains the same wording. Lot 173089J and EXP 09/19 is coded on the side panel of the carton. Product was distributed nationwide to retail outlets. The Weinberg Law Firm is currently assisting those injured by defective medications and products including Talc Lawsuit and Food Poisoning Lawsuit. Please see NJ Injury Lawyer to learn about our firm and legal services, or call our office toll free at 877-934-6274.